On the successful completion of this course you will be awarded a Nationally Accredited Diploma of Equine Podiotherapy (22290VIC) and may use the title of Equine Podiotherapist in your practice and advertising. You will also qualify for membership with the Equine Podiotherapist's Association and have access to ongoing learning and networking with other Podiotherapists. What you will NOT learn! You will NOT leave the Equine Podiotherapy Diploma Course with a one size fits all approach to your work. Trimming based on that premise is set to fail and most horses with serious hoof problems fall far outside those parameters .... and these are the horses that most need your help! But you WILL learn a paradigm based in equine orthopaedics and based on equine anatomy studies. Current first aid certificate must be presented to the college prior to completion of the diploma course but we do encourage students to complete a first aid course prior to commencement. You must be over 18 years of age to participate, willing to study and undertake case histories as part of your course. 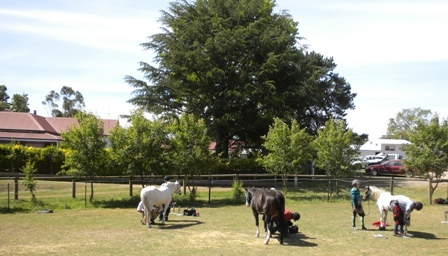 Because this career path is relatively new and those who are seeking to obtain education come from a wide cross section of the community, male and female, young and old, the course developers felt that setting prerequisites based on previous education/experience was unfair and would prevent many people who are passionate about hoof care from attending. The sky is your limit! This training opens up a huge field of work. In Australia at present the demand for properly trained natural hoof care specialists far exceeds the supply. It is impossible to meet the demand for Equine Podiotherapists at this time! In a world of shrinking careers your horizons in natural hoof care are limitless! Your skills will even take you outside this country if that is what you wish. These are held once a year and these ongoing learning opportunities are offered to those who have studied Equine Podiotherapy. The guest lecturers are drawn from those who are working at the cutting edge of equine hoof care and research. The course is classified as full time and is designed to be completed in two years. In the first year, the course is delivered in four intensive 6-7 day blocks of face to face lectures and practicals complemented by distance learning modules. Assignments are to be completed between the blocks. Students then have to complete a series of case studies within their second year. 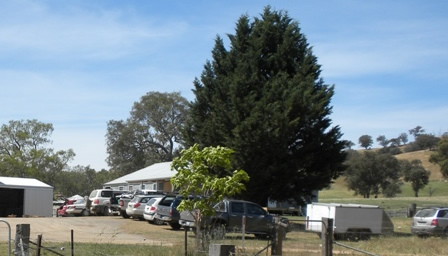 The college is based at Mayfield, 470 Middle Creek Road, Yarck, in north-east Victoria. Mayfield is a 1000 acre beef, sheep and horse breeding farm, offering horse agistment and lameness rehabilitation, specialising in laminitis. The campus provides a comfortable air conditioned classroom, student amenities, accommodation and camping facilities. There is also a full range of off-campus accommodation within easy driving distance. The first block usually commences in February. Please consider booking early (even the year before) as the course usually fills very quickly and places are limited because of the hands on nature of this training. This is a competency based course. Assessments include in class practical and written assessments, oral presentations, written assignments and a major case study portfolio. The fee for the 2018 Diploma Course is $7000. payable via a payment plan. Victorian students may be eligible for the Skills First program, however accessing the Skills First program may impact students wishing to undertake further government subsidised training.